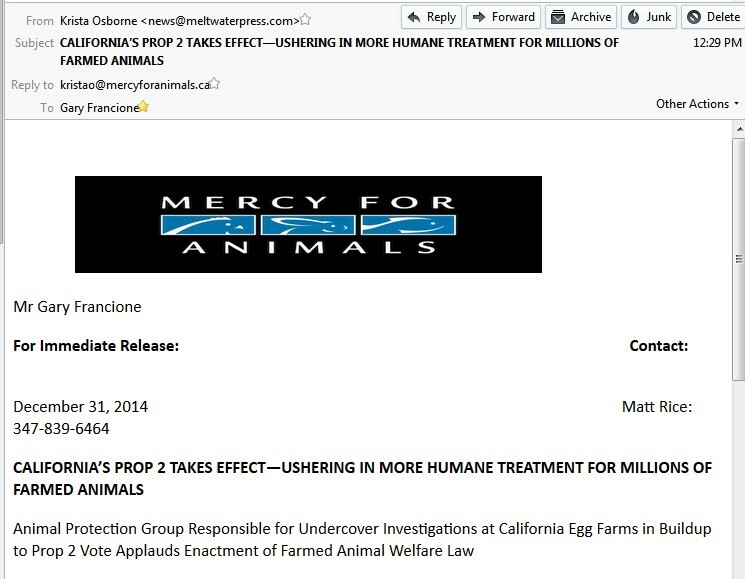 I just got an email containing a press release from a PR firm on behalf of Mercy for Animals. 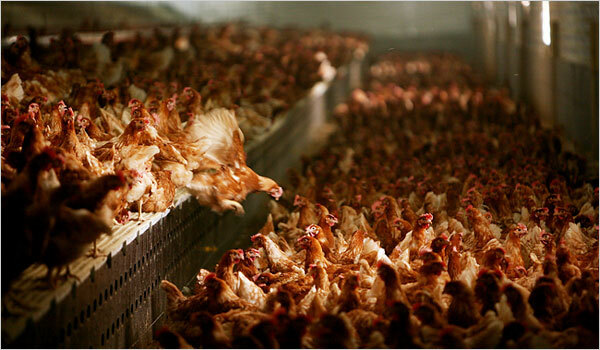 It is not clear whether Proposition 2 requires “cage-free” conditions. 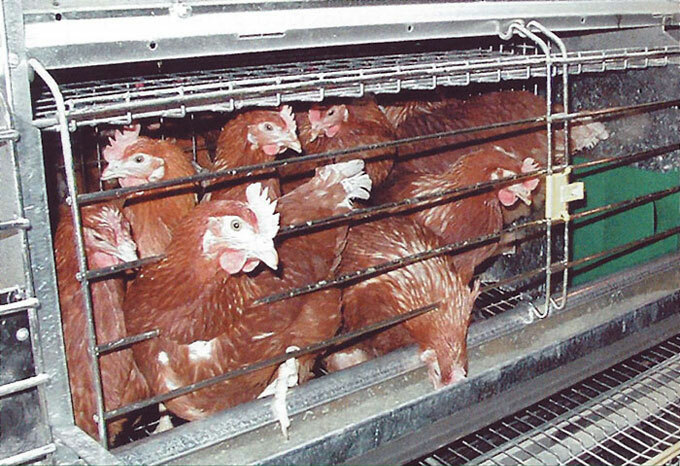 Some claim that it is satisfied by “enriched cages,” such as the one pictured below. First: Confining these poor birds in cage-free barns does not amount to “respect.” And it is outrageous to use that word in this context. Second: “Cage-free” does not “protect” the birds. Third: MFA suggests that cage-free addresses “needless” suffering. Since we do not need to consume eggs for optimal health, all suffering in this context is needless. Fourth: MFA tells us that cage-free is what a “civilized nation” does. Fifth: And for a so-called “animal advocate” to suggest that cage-free barns are not “cruel and inhumane” is nothing short of a betrayal of nonhuman animals. Sixth: The word “vegan” appears nowhere in the press release. This is nothing more than “happy-exploitation” propaganda and for groups like MFA to claim that statements like this are not intended to make people feel better about consuming “happy” animal products is either a matter of dishonesty or delusion. 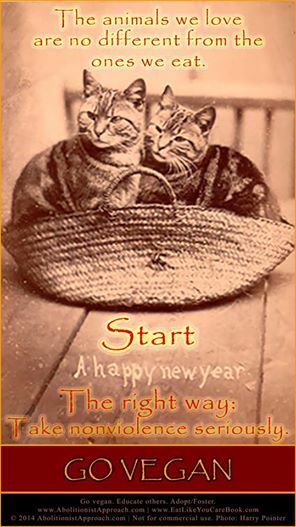 And never, ever buy into the nonsensical notion that we need to promote “happy exploitation” in order to get people to go vegan. It’s the opposite: the entire “happy exploitation” industry has one goal: to make the public more comfortable about animal exploitation. If you are not vegan, please go vegan. 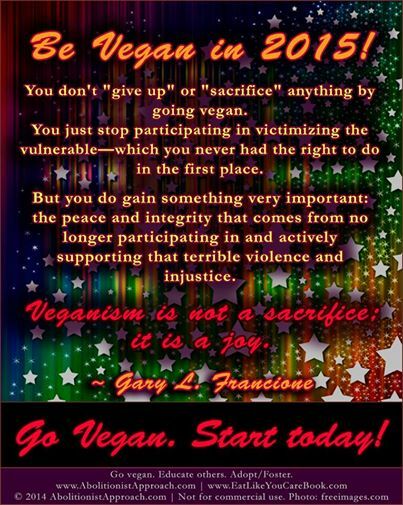 Veganism is about nonviolence. 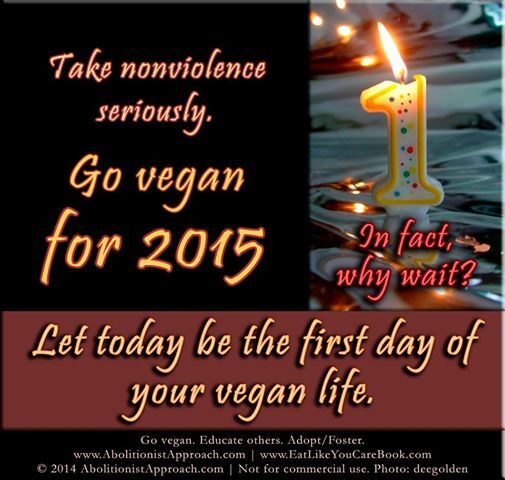 First and foremost, it’s about nonviolence to other sentient beings. But it’s also about nonviolence to the earth and nonviolence to your body. 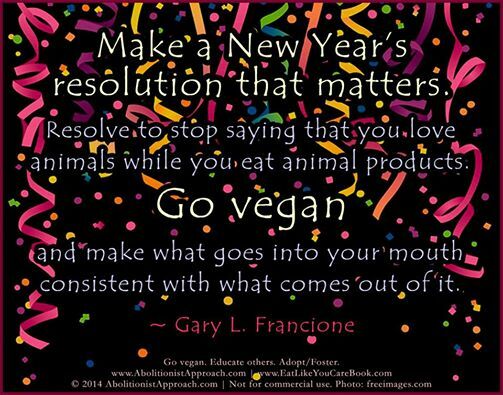 http://www.abolitionistapproach.com/wp-content/uploads/2015/09/aa_logo.png 0 0 Gary L. Francione http://www.abolitionistapproach.com/wp-content/uploads/2015/09/aa_logo.png Gary L. Francione2014-12-31 14:29:562014-12-31 14:29:56Happy 2015! Most of the large groups focus on “factory farming.” This is absurd for at least three reasons. First, these groups claim to be eliminating the “worst abuses” of the system. That is false. 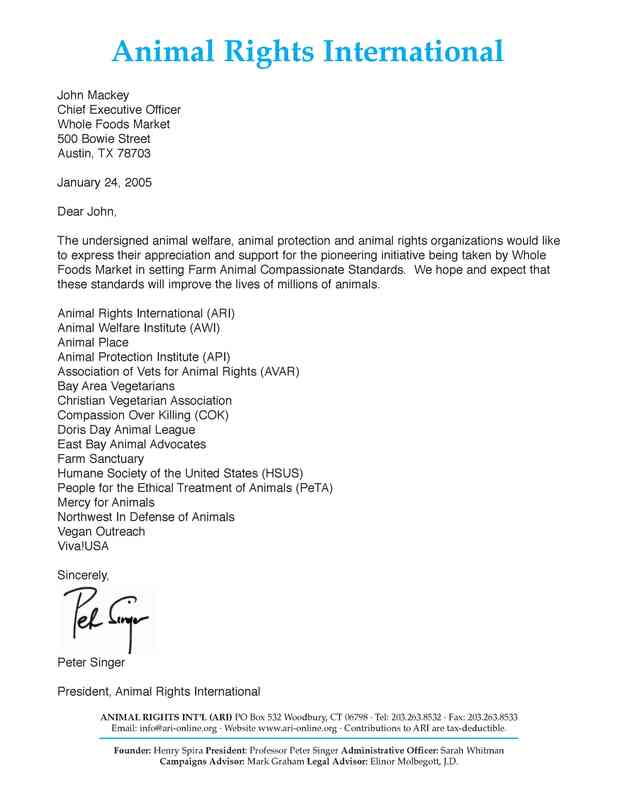 The entire system is one big “worst abuse” and the animal groups are merely focusing on (i.e., doing fundraising campaigns on) a few practices that are, for the most part, economically vulnerable anyway. These groups pretend that “factory farming” will be history if the gestation crate is eliminated or if conventional battery cages give way to “cage-free” barns, But that is just wrong. The pigs and chickens will still be tortured and killed. Second, these groups promote the idea that there is a difference between “factory farm” exploitation and “family farm” exploitation. There is still an enormous amount of suffering and distress on any farm. This fantasy of the idyllic “family farm” is just that–a fantasy. And the animals all end up in the same slaughterhouse much of the time. They are, in any event, all slaughtered. These groups all promote or support some sort of “happy exploitation” scheme. But these schemes still involve animals being tortured and killed. Their primary impact is to reassure consumers that they can be “conscientious omnivores” and keep contributing to animal groups as they feel good about continuing to eat and wear animals. Third, if animals matter morally, we should not be eating, wearing, or using them whether they are from “factory farms” or from “family farms” or have a “happy exploitation” label slapped on their corpses. We cannot justify inflicting any level of pain and suffering on another sentient being when the only justification is palate pleasure or fashion. We don’t even need a theory of animal rights for that; it follows simply from the position that animals are not things and that they have moral value. 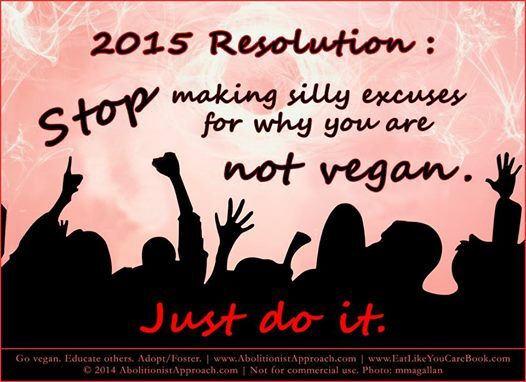 The problem is not “factory farming.” The problem is all animal farming; the problem is all animal use. These “factory farming” campaigns have nothing to do with animals. They are fundraising vehicles for the large groups. If you care about animals and think that they have any moral value, you go vegan. It’s that simple. 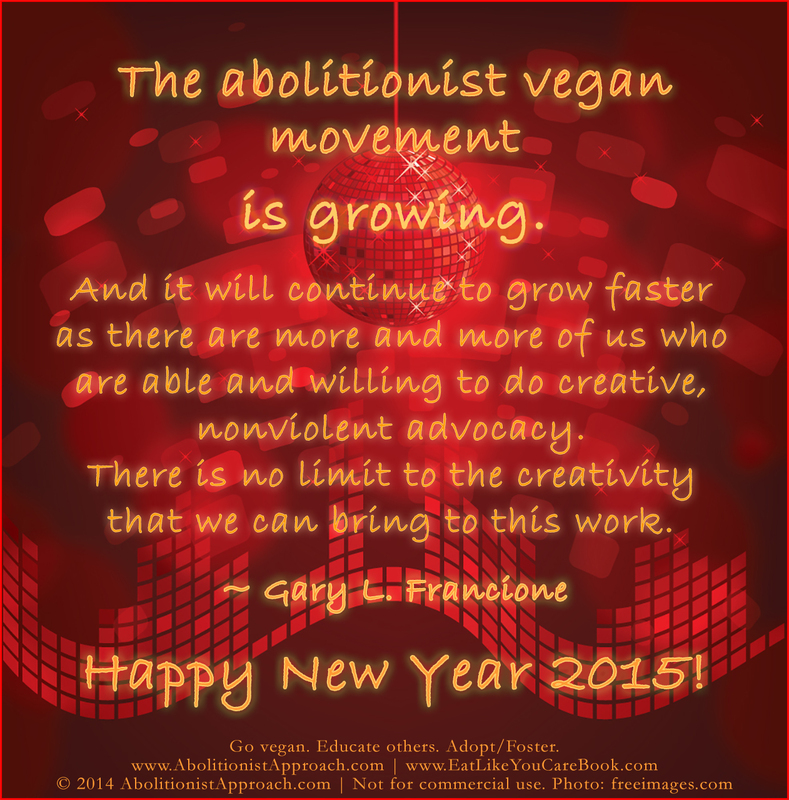 http://www.abolitionistapproach.com/wp-content/uploads/2015/09/aa_logo.png 0 0 Gary L. Francione http://www.abolitionistapproach.com/wp-content/uploads/2015/09/aa_logo.png Gary L. Francione2014-12-26 08:18:182014-12-26 08:44:42The Focus on "Factory Farming"
If you are a Christian, think about how bizarre it is to celebrate the birth of the one you call “Prince of Peace” with violence. If you celebrate Christmas, make it a vegan day. If you really believe in peace and love, make it a vegan life. Nothing else makes any sense.